For many years, women employees quitting jobs post maternity has been a critical concern for corporates in India. With McKinsey Global Institute1 predicting that India could add more than 18 percent to its GDP by 2025 simply by giving equal opportunities to women, increasing the female workforce participation has become a key focus area for not only organizations but the entire nation. Keeping the importance of women’s contribution to the country’s GDP in mind, the government of India made amendments to the Maternity Benefit Act, 1961 and extended the paid maternity leave of 12 weeks to 26 weeks for women working in the organized sector. The Maternity Benefit Amendment Act (2017) that came into force on 1st April, 2017 also brought into force adoption and surrogacy leaves and introduced the option of work from home to the bill. To also cater to the needs of working mothers post maternity and to ensure that they resume work, the 2017 Bill also made it mandatory for each establishment with 50 or more employees to have a crèche facility. The understanding and awareness of employers with regards to the amendments made in 2017 for example, the duration of the paid leaves different organizations provide to the working parents in cases of natural childbirth, adoption, and childbirth through surrogacy; the ways in which employers are providing crèche facility to the working parents; and the ways in which employers are communicating with their employees to increase awareness about childcare facilities. 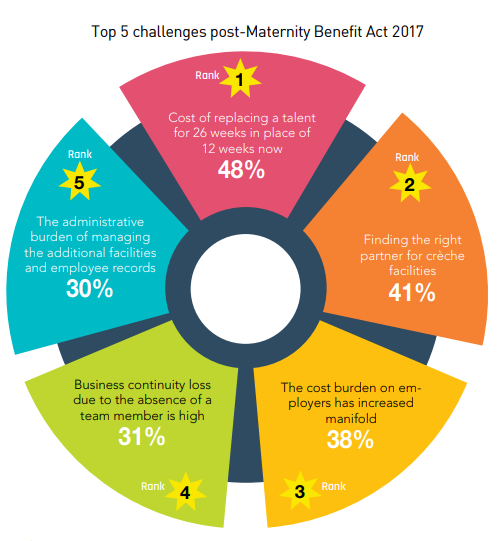 Insights from the study indicate that a majority of the employers have experienced a positive impact on business with the latest amendments to the Maternity Benefit Act. For about 60 percent of the organizations, the amendments have made a positive impact both on retention and work culture. However, only 29 percent of employers witnessed a positive impact on talent acquisition. The survey further highlights the challenges employers face while complying with the childcare facilities as stated by the amended Maternity Benefit Act 2017. Cost of replacing a talent for 26 weeks instead of 12 weeks (48 percent), finding the right partner for crèche facilities (41 percent) and the increase in the cost burden of employers (38 percent) are the top challenges the employers are facing. 61 percent of the employers want that there should be a tax exemption for providing childcare facilities and 57 percent of them wish that the scope of benefits of the Act should be extended to working fathers as well. As companies struggle to cope up with the cost burden due to business loss and additional cost due to childcare facilities, they would appreciate if the cost was borne by the government either partially or fully (37 percent). More than half of the employers seek further clarity and more defined rules and guidelines from the Maternity Benefit Act. While less participation of women in the economy and the gender pay gap continues to be two of the major challenges, India is slowly moving towards achieving the goal of gender equality and inclusion with large and small organizations across industries working towards bridging the gender gap. The study showed that 94 percent of the organizations are complying with the Maternity Benefit Act amendment made in 2017. However, out of these, strengthening gender diversity is a key focus area for just 74 percent of the employers, thus indicating that some organizations (about 20 percent) are providing maternity benefit only for the sake of compliance. While 72 percent of the respondents are providing 6 months to 9 months of paid maternity leaves as stated by the law, 25 percent are still providing less than 6 months but more than 3 months of paid leaves. With more and more organizations realizing that equal parental leave enables both men and women to succeed at home and work, many employers have also introduced paternity leaves in their organizations. Although they are shorter in the term, however, it is a step towards building a gender-equal culture. The survey reveals that 77 percent of employers are providing paid paternity leaves to the working fathers; however, 23 percent of them have still not walked this path. While research2 shows that surrogacy is becoming a million dollar business, according to the Central Adoption Resource Authority (CARA), 3,276 children were adopted in 2017-18 in India. As many working professionals become parents through modes other than natural birth, it is important for both the government and the employers to extend the scope of parental benefits to cases that go beyond the natural methods and means. While the majority of the employers who participated in the survey provide maternity leaves for cases like adoption (86 percent) and childbirth through surrogacy (76 percent), the percentage is relatively low in the case of paternity leaves. 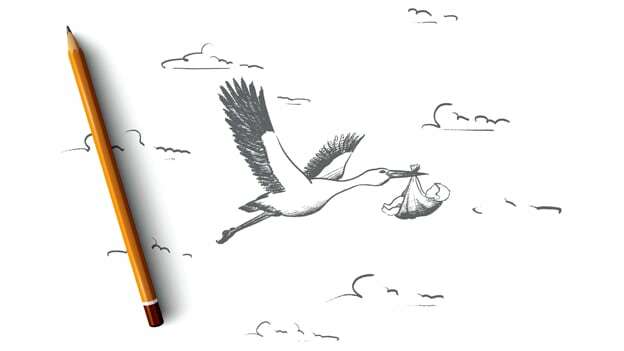 About 65 percent of employers provide paternity leaves in the case of adoptions and 58 percent in cases of surrogacy. On 27th March, the Maternity Benefit (Amendment) Bill, 2017, passed by both Houses of Parliament received presidential assent. The amendments made it mandatory for each establishment with 50 or more employees to have a crèche facility. While statutes such as the Factories Act, 1948, and the Contract Labour (Regulation and Abolition) Act, 1970 already contained provisions around crèche facilities, the new mandate in the Act increased the scope of the childcare facilities and impacted regional and country offices of larger organizations and some SMEs and startups as well. For companies who already extend such facilities, the amendments didn’t have much impact but for the others, this was a new challenge. From redistributing budgets to looking for the best ways to provide childcare facilities to their employees, HR and leaders had a new mandate to fulfill. It has been more than a year now that these amendments were made, however, about 31 percent of the respondents still don't have a formal structure or policies around childcare facilities in place yet. Some employers either don't have facilities in all the offices/locations or are still looking into it and exploring ways to serve these facilities to working parents. As per the survey, about 60 percent of the employers either have in-house crèche facilities in the office or have outsourced the service to different third parties or provide a combination of different services with respect to childcare. The rest 8 percent of the employers either reimburse the crèche expenses for working mothers or provide crèche allowances in advance. Partnering with an external childcare facility was a preferred choice by a majority of the employers (36 percent) as compared to having an in-house facility. Organizations seem to prefer collaborating with a third party vendor for a multitude of reasons including lack of space in the office and lack of knowledge and skills of the subject matter in the internal teams. While the research3 says that employers struggle to fill talent gaps created in the event of 'maternity continuum' of women employees, the maternity benefits such as maternity leaves also have also had a positive impact on the business. The top two areas where businesses have gained through these benefits include retention and workplace culture. As per the survey, 60 percent of the employers experienced an increase in retention and a positive impact on workplace culture post-Maternity Benefit Amendment Act (2017). However, when it comes to talent acquisition, employers feel that benefits like these are less likely to have a huge impact. Only 29 percent of the respondents stated that the act has positively impacted talent acquisition, while 13 percent said that it has negatively impacted talent acquisition. While the rationale of the amendments made to the Act was strong, the financial burden these changes came with have made its implementation a challenging task. About 48 percent of employers struggle with the cost of replacing a talent for 26 weeks and 30 percent are facing trouble with the administrative burden of managing the additional facilities and employee records. Having childcare facilities as one of the key amendments of the act, one of the major challenges for the employers has been finding the right partner for crèche facilities (41 percent). The lack of clarity in the rules under the amendment and integrating working mother back into work post-maternity were also highlighted as some other challenges by the respondents. Many startups and SMEs resist hiring women employees due to such challenges, hence diluting the entire gender diversity and equality agenda. 1 out of 5 organizations with employee strength less than 1,000 feel that the amendments have negatively impacted talent acquisition while about 55 percent of these organizations are struggling with the added cost burden and 30 percent struggling with the loss of business continuity due to the absence of a team member. So, the question is, are these benefits actually strengthening or weakening gender diversity? While in India the financial burden is supposed to be borne by the employer fully, in most of the other countries, the cost of maternity leave is shared by the government, employer, insurance agency and other social security programs. In Singapore1, for example, the employer bears the cost for 8 weeks and public funds for 8 weeks. In Australia and Canada, public funds bear the full cost. A social insurance scheme bears the cost in France. In Brazil, it’s shared by the employer, employee and the government. Although there are some solutions and strategies which can ease the challenge and smoothen the implementation process of these amendments (for instance, the government sharing the cost of maternity leave with employers, amplifying tax rebates for maternity wages or setting-up an insurance scheme to pay maternity wages, or sharing the premium with the employer), there is still a long way to go. The survey, thus, deep dives into the remedies to overcome the challenges with the Maternity Benefit Amendment Act (2017). 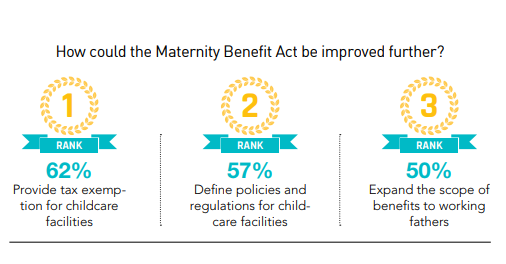 Provide tax exemption for childcare facilities (62 percent), define policies and regulations for childcare facilities (57 percent) and expand the scope of benefits to working fathers (50 percent) are the top three ways in which employers wish to see the Maternity Benefit Act improve further. While many companies took the lead and implemented longer maternity leaves and childcare facilities even before the Act came into effect, the reality is that employers are bearing this additional cost by themselves. Hence, 35 percent of them wish that a portion of the cost or total cost of providing childcare facility should be borne by the government. This could specifically be beneficial in the cases of SMEs and startups who already run on small budgets. Further, about 23 percent of employers want the government to also share the cost of either a portion of leaves or total maternity leaves. This is a common practice in many countries. For instance, in Singapore1, out of the 16 weeks of paid leave, 8 are funded through public funds and in Australia and Canada, the respective maternity leaves of (18) and (17) weeks are paid by public funds. In India, however, except for the fraction of employees covered under the Employee State Insurance Act (ESI Act) (i.e. employees earning not more than INR 21,000 per month), maternity benefits have to be financed by the employer. Leaving the centuries-old gender biases behind, businesses in India are spearheading towards having a gender-inclusive workplace. However, there are still many more obstacles that need to be crossed in this journey. Besides struggling with financial constraints like bearing the additional costs and loss of business hours in the process of supporting working parents, organizations also have to deal with the biases that the society holds. While large MNCs like Accenture, HUL, Infosys and IBM have had strong policies around a gender inclusive culture, other organizations are now catching up and introducing initiatives to build a gender inclusive culture. Although with the abolition of Sec 377, organizations would now have to redefine their policies and expand the scope of their initiatives, they still have a lot to achieve in the context of empowering the women workforce. More support from the government can make the efforts of the organizations stronger. Besides strict mandates around maternity leaves and childcare facilities, businesses are looking for aid in terms of sharing cost burden and amplifying tax rebates for maternity wages. With 62 percent employers choosing ‘provide tax exemption for childcare facilities’ as the key remedy, authorities need to relook at the current law and redefine the Maternity Benefit Act. Based on the experience of employers after more than one year of the amendments to the Act, defining policies and regulations for childcare facilities (57 percent) is one of the critical areas that need attention. "When policy changes applicable to ‘for profit’ entities entail increased costs for these organizations, there are bound to be unintended consequences which dampen to potential positive impact these changes are intended to have. In India, despite the long wait for many of the changes that were brought in through the Maternity Benefit Amendment Act (2017), many of the corporates, whether or not they eventually complied with the act, were left financially and structurally unprepared to integrate these policy changes. Something that gets reflected in the fact that 31% of the employers who participated in the survey do not have a formal policy around childcare facilities for employees."